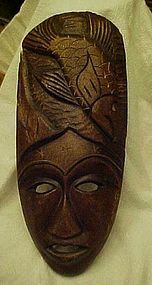 Hand Carved in Haiti, Wooden Mask. Wonderful Fish Design at the top of Mask. 12 1/4" Long X 5 1/4" Wide (at widest point) Great Condition!! It has a wall mount for hanging. 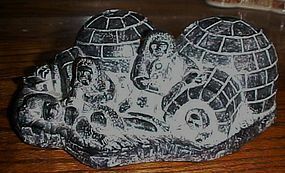 Great Soapstone carving oftwo Igloo with Inuit Family, Pet Dog, Sled & Fish outside, measuring 7" X 3". NUVUK Canada. Bottom on a piece of tape says 1981 Victoria Canada, so was probably where it was purchased at that time. Possibly older than the date. Wonderful condition,no damages. 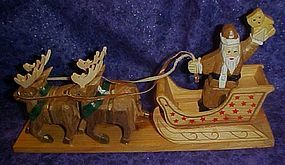 Nice carved wood Santa Claus waving from his sleigh and four reindeer.Leather reins. Hand painted and varnished. Perfect condition with no damages or missing pieces. Measures 12 3/4" long and is 6 1/4" tall to the tip of the teddy bear Santa is holding. A nice folksy Christmas decoration for your holiday decor. 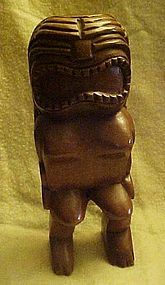 A neat Hawaiian tiki statue carved from wood, with a nice varnished finish. I think this is a Happiness tiki, just look at that smile! 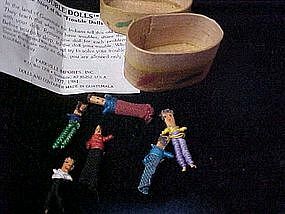 Measures 10 1/4" tall. Excellent with no scratches but a tiny tip of one toe is chipped (looks to have been done before it was stained and varnished though) Maybe you can see it in the picture. A neat statue for your Polynesian decor. 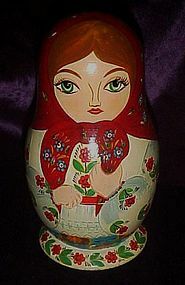 Set of 7 hand painted wood Russian nesting dolls 6.25"
Very nice old hand crafted wood smoker from Germany. Unfortunately she had lost his tag, but you can tell he is German by his craftsmanship. He measures 6 1/4" tall and is perfect. He carries an evergreen tree and a sack on his back. 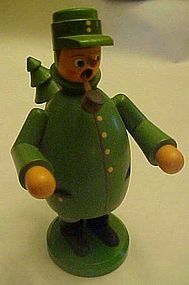 Body area lifts off so you can place an incense cone inside and the smoke will come out of his mouth so he appears to smoke. Excellent condition, no fading or flaking of paint. This lamp was stolen from the shop. Please email if you see it. This hand carved wood African fertility doll symbolizes the beauty of fertility.She wears seed bead earrings, necklace and anklet. 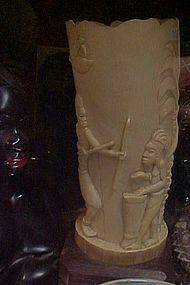 Carved front and back.It is considered to be the blessings of the ancestors that allow a woman to have children. In fact, main goal of most African women is to have children and there are great celebrations when children are brought into this world. 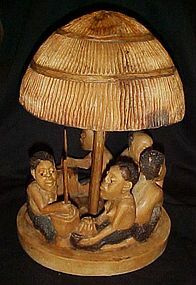 This statue will bring great beauty to your African decor. Dimensions 13" High. No damages, chips or cracks. 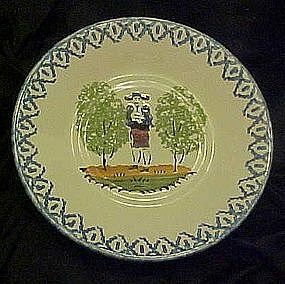 A great old plate in the Quimper style, but just singed France on the back. It depicts a quaker man standing between two trees. Looks like a cup plate or saucer, as it has a gentle well. 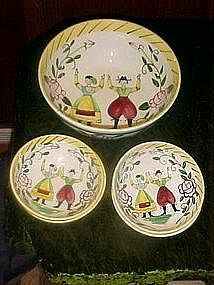 Measures 5 1/4" in diameter,and is hand decorated. No chips or cracks. A wonderful hand carved statue of the historical Don Quixote of Spain. This is in awesome condition and measures 13" tall and is carved from a single piece of wood. Nice facial detailing. No cracks, chips or repairs. Nice patina.Not sure of the age, it could be older. 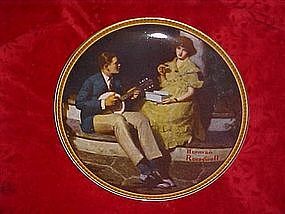 From Norman Rockwell's Rediscovered women series is this issue titled Pondering on the porch. Measures 8 1/2" in diameter and is in perfect condition. Knowles china. Comes in the original box with certificate of authenticity. 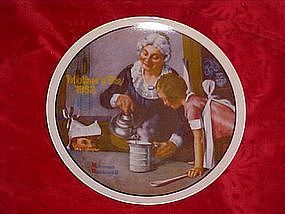 Norman Rockwell Mothers Day 1982 annual plate by Knowles china. Measures 8 1/2" and is in perfect condition with its box and paperwork. Titled "The cooking Lesson".